So this tour is a bit second-hand. 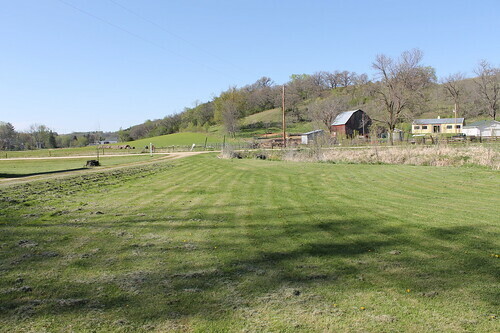 You see, my wife and parents went up to Minnesota without me in April, and they were the ones who looked at this farm. They were nice enough to take plenty of pictures for me, and give me a good verbal walk-through of the place. 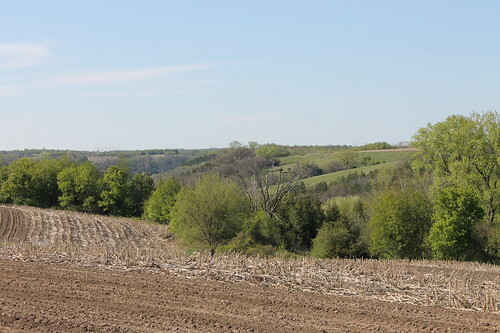 This farm is about 5 miles outside of the town of Red Wing, Minnesota. You know, the one with all the shoes. 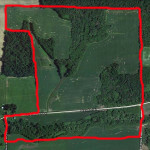 The biggest farm we’ve looked at so far at 157 acres. Plenty of paved road frontage for a farm store. 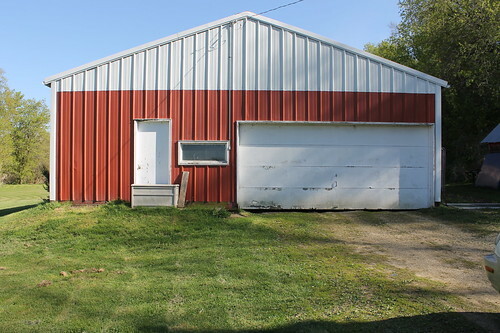 Good buldings: House, newer pole barn, old barn in good shape. This farm, like the last one, already has buildings on it! 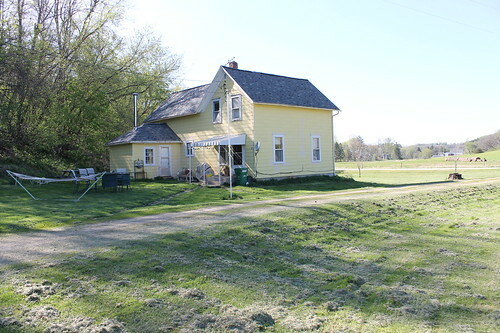 There’s this old farmhouse which appears to be in pretty decent shape. And there is a newer pole barn. And then there is this low-lying area between the buildings and the road. There is a natural spring that originates on the farm here and flows on into Spring Creek. 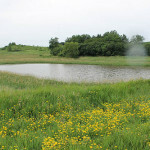 Spring Creek is fed by at least two other springs from other farms and it feeds into the Mississippi River in Red Wing. Now the spring is really great and back in the 1890’s it must have seemed like a great idea to put a house just uphill from this spring. Fast forward a few decades and all of the sudden the DNR doesn’t like the idea of a septic system anywhere near the spring. It’s grandfathered in until the property changes hands. At that point the septic system becomes non-compliant and will have to be torn out. Options are as follows: A.) Build pump station to pump sewage uphill to a new lagoon or leach-field. B.) Tear down house and rebuild elsewhere. 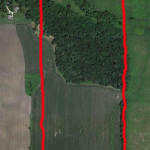 Anyway, the rest of the farm purports to be 105 acres of tillable ground, with only 32 acres of woods. It sure looks like a lot more woods to me on the satellite picture. The land rises at a pretty good rate as you get farther from the gravel road. Up on top of the tallest hill (the biggest cropfield with the contour lines) there is quite a view. Unfortunately, there is also quite a smell. This is true not only up on the hill, but also down near the road by the house. A quick check of the map shows where the smell is coming from: two huge hog confinement barns and one huge liquid manure lagoon. Hooray! 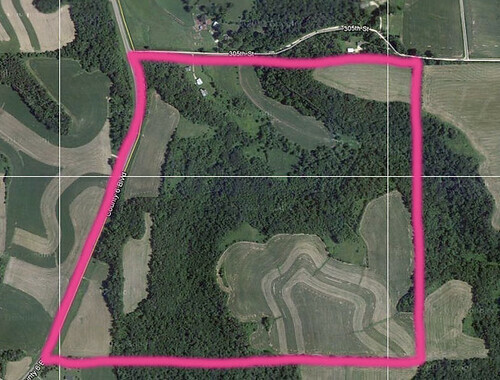 Oh, and I almost forgot, being 5 miles from Redwing also puts this farm about 6-7 miles from the Prarie Island Nuclear Power Plant and well within the “plume exposure pathway zone.” (the 10-mile evacuation zone if the nuke ever goes all Fukushima) Hooray again! Nice place, but im sticking with Zumbrota. Bummer about the septic. Also, you are wrong about the house being in decent shape. None of us thought we could live in it–like at all. It smelled like a dog pound in there.